I've been interested in the Play 101 range ever since Pony filmed a few tutorials using them (links to those videos here). The idea of having a whole line of makeup pencils that you can use for your entire face is pretty genius. A lot of the colours are really versatile so you can use them on your eyes, cheeks, and lips if you want! I picked up shades 22 and 25 because I think they make gorgeous lip colours. The product: Twist up pencils that are both in Play 101's 'glossy' category. According to the Etude House site, glossy pencils have a 'moist texture' and they recommend using them for lips and cheeks. The packaging: I really like the stylish look of these pencils. I'm not always swayed by Etude House's cutesy packaging (unless it's too adorable to resist) so I'm glad they went with a chic look for this product. The pigmentation: They are bold colours but it takes a few coats to until they look really vibrant on the lips. 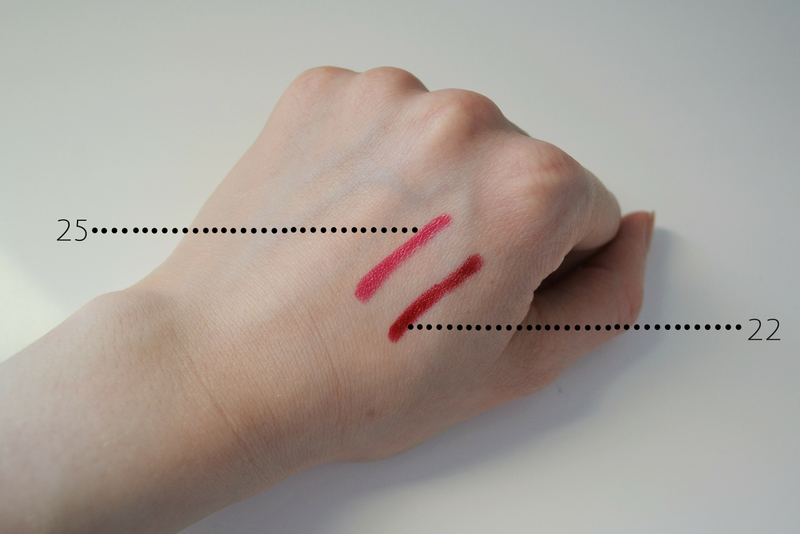 This does add to their versatility though - you can use the pink shade as a blush if you apply it lightly and blend. The application: I love using makeup pencils since I find them easy to use. 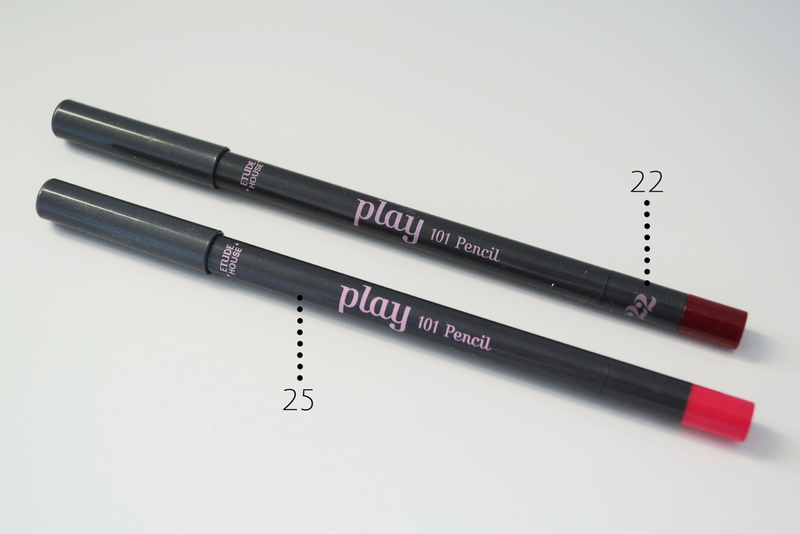 The Play 101 pencils are no exception - it's easy to be precise and the formula means they just glide on. 22 is a darn good classic red. It bothers me when I swatch red lipsticks in stores and they end up being on the pink or orange side but this one did not disappoint me. 25 is a lovely bright pink. Both of these are build-able so you can go for a toned-down look if you wish. The road test: This would have been a glowing review but sadly these pencils aren't very long lasting. Normally, this doesn't bother me with my lip products as I'm always prepared to reapply. However, these normally rub off in the middle of your lips so you're left looking like you're just wearing lip liner. I'm not really a fan of this look, so if I use these pencils I have to keep checking my lips to make sure they look okay. Overall: I would completely love these pencils if it wasn't for the way they fade throughout the day. However, since the Play 101 range is really simple to use, I would love to try some of their other pencils for blush and eyeshadow. It looks nice on your lips. Thanks! They have lots of other colours and you can use them all for different things, so they are pretty useful.